The Phillip Island circuit holds many memories for me throughout the years that I have spent in Motorsport. From a driver’s perspective it is a tremendously exciting and testing race circuit with the high-speed nature of the layout. It was the circuit where a young Garth Tander had his Supercar debut with GRM in 1998 and where Jason Bargwanna had a massive crash off the start line a year later. Twenty years on and credit must be given to those responsible for the maintenance of the Phillip Island Grand Prix circuit and grounds. The presentation and condition are first class and with superb Melbourne spring weather and Bass Strait as the back drop it made me feel tremendously proud that in our small country that we have some of the very best Motor Racing circuits in the world. The Phillip Island round was one week after the Symmons Plains round and it is the first time ever that we have had Supercar Championship rounds back to back. Personally, I love the idea of racing week in and week out. I am a huge fan of Sprint Car racing and although a less technical form of Motorsport these guys and girls travel the countryside often racing several times a week during the summer months. Joey left Burnie (NW Tasmania) on Monday night and arrived back at the workshop mid-morning on Tuesday. The cars were unloaded, Brushes (our sticker man) came in and tidied up the cars and the crew set about restocking the truck, cleaning the cars and wheels and repacking by Wednesday night. Joe is always on the lookout for adverse weather and if necessary, will time his run to avoid getting his Volvo Globetrotter and trailers dirty. On Wednesday afternoon I saw him checking the weather on his phone and with a chance of an early shower on Thursday Joey made the decision to head off to Phillip Island on Wednesday night. The potential early shower surprised me and after looking at the BOM website I couldn’t see the “potential” showers that Joey was referring too. What I did know was that Joey loves the sleeper cab in the Volvo FH16 Globetrotter and his devious plan was to spend a night tucked up in the bunk! In normal circumstances I would be travelling to a race meeting on a Thursday but living an hour from Phillip island and having plenty to do around my farm I spent Thursday mowing, cutting, fixing, chopping and washing. I was knackered! Friday morning and Barry picked me up at 7.00am. I quite enjoy being chauffeured around and particularly through the picturesque countryside of Gippsland. It was also very pleasing that for the first time in 7 years Barry didn’t miss the turnoff that is necessary on one of the back roads that is required to avoid 10klms of bumpy unmade roads that my 70 plus year old body can no longer handle. Friday and the usual 2×30 minute practice sessions. The #34 and #33 were 17th and 21stfollowing these sessions and would hence have to participate in Q1 on Saturday. Five of the first 6 cars were Mustangs with the Nissan of Rick Kelly separating them in 5th. There has of course been a lot of talk in recent times regarding centre of gravity (COG) and the aero of the Mustang. To be honest we (GRM) have other issues to address before we need to be too concerned about the Mustang. In saying that, what I would say is that we are a parity sport and although we have a relatively stringent testing/homologation procedure there is no doubting that the “true” performance of a car is never known until racing begins. I am sure that we are in good hands. Qualifying on Saturday and it was yet again the Mustangs on McLaughlin, Coulthard and Mostert followed by a Nissan, but this time it was Andre Heimgartner who did an exceptional job to qualify 4th. In Q1 James Golding had a disfunctional front anti-roll bar that forced him straight back to the pits and missing the 10-minute session. Richie qualified 19th and the field had some surprises with Whincup 17th. Following qualifying and a chat to the crew, I went for a walk around the support garages and to the other side of pit lane to look at the cars on display. I really enjoy the camaraderie of race teams particularly the family ones where mum, dad and the kids are all involved. In most cases (all!) mum is the Team Manager! The 120klm (27 lap) race required one compulsory pit stop for tyres. The tyre used at Phillip Island is the hard compound tyre and the high-speed sweeping corners certainly put an incredible load on the Dunlop tyre. It is part of Supercar rules that the tyre must start with a minimum tyre pressure of 17psi and by race end this pressure has risen to approximately 30psi. The tyre also encounters some incredible stresses with in excess of 800kg of load through a tyre under braking. Off the start it was the ever-reliable McLaughlin who beat his teammate (Coulthard) off the line with the Nissan’s of Kelly and Heimgartner next. Golding started particularly well picking up 4 positions on the opening lap and showed excellent pace throughout the race. Richie also had race pace as he battled with Whincup. The pit stops began at lap 5 and as the race settled for the run home it was till Mclaughlin from Coulthard and Heimgartner had moved to third. 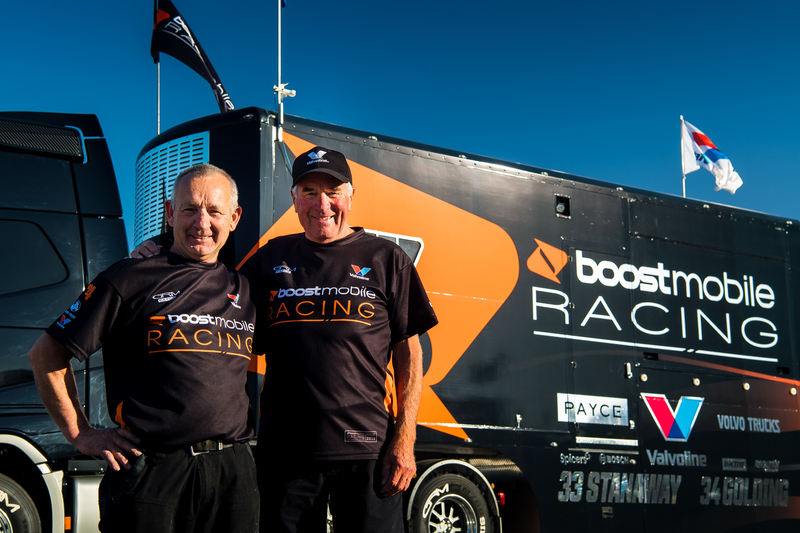 Golding had got past Stanaway and the Boost Mobile cars came home 13thand 14th. Sunday and again a 7.00am pick up. I love Sunday breakfast because Dom (GRM chef) makes ham and cheese toasties, they are the best. A matter of fact, Dom has caused a little tension with the GRM outfit. Unknowingly to Dom, many of the crew when they return home go on and on about what “Dom cooked”. I am of the belief that at least one has been told “if he is that good, then why don’t you marry him!”. Unfortunately, he is not my type! Sunday morning practice and Bieber (#34) was 5th quickest behind four Mustangs led by Coulthard. This effort elevated James straight to Q2. Richie just missed on progressing to Q2 and qualified 17th. In Q2 as Bieber did his first qualifying run with an 80% effort lap followed by his all-out qualifying run. As he travelled around the track on his in lap to put fresh tyres on and go again it appeared that he would be struggling with time. Following his stop Bieber hustled around but the session expired 0.8 of a second before he crossed the start/finish line to begin his qualifying run. This was very disappointing as James and the #34 crew had found something and it appeared that he was set for a positive qualifying result but would now start 14th. To be totally frank these things should not happen, and it is important that we analyse why this occurred and make sure that it doesn’t again. Scott McLaughlin yet again led a Mustang front row with Coulthard. The surprise was Anton DePasquale who qualified on the second row in 4th. The Sunday 200klm (45lap) race is certainly not one to celebrate from our perspective. The race required two compulsory pit stops for fuel and tyres. Over the two stops a minimum of 120 litres of fuel had to be added. On lap 5 Lewis (#34 Engineer – Manuel Sanchez) called Bieber in. As Bieber exited turn 11 (2nd last turn) and approached the pit lane entry which is a very high-speed entry to that sweeps to the left while approaching turn 12 he radioed that he was going past. Krusty (#33 Engineer) then took the opportunity to call Richie in and the pit crew quickly returned the #34 tyres and gathered the #33 tyres. But Bieber didn’t drive past and complete another lap. At the very last moment he ducked in to pit lane as Nick Percat (BJR) who was in front of him had chosen to stay out and Bieber took the opportunity to try and undercut him. At this point the pit crew did a sensational job of regathering the #34 tyres, yet Richie was now also in the lane only 20-30 metres (2-3 seconds) behind the #34 and would have to sit and wait as the wheels were changed and fuel added. After a promising opening five laps Richie was now at the rear of the field. As the second stops were completed Coulthard had taken the lead from McLaughlin and DePasquale had raced his way to third. This is how it finished and yet again a Mustang and DJR 1-2. For the second day running it was fantastic to see a young up and comer take it up to the more experienced guys and I was very pleased to see Anton DePasquale match the previous days effort of Andre Heimgartner and finish on the podium. Our day went from bad to worse as both the #33 and #34 cars experienced right hand front tyre failures in the final laps. As I write this I am back at work and I can assure you that we will be having some very open, honest and frank discussions. MOMENT OF EXCITEMENT​​–​the thought of one ice-cold pot at the Longwarry pub on the way home on Sunday afternoon. MOMENT OF DISAPPOINTMENT​–​Barry refusing to stop!